I am in such a spring time mood! I want to create, clean and just focus on all things artistic! I’ve done the spring cleaning. I actually took time off from work, as I do every year. I was home alone and I cleaned closets, finished painting projects, and of course, started painting projects (...still painting after 7-years!) Working, school, running and life certainly have a way of pushing painting to the bottom of the list, but I paint when I can; a few hours each week. I was thrilled to give about 5 boxes of clothing and household items to the Salvation Army so that someone could give the items new life. You know how much I love to reuse and recycle. The desire to create, write and go forward with purpose has caused me to want to blog and reconnect. I’ve been visiting blogs, eventhough I’ve been negligent in my own blogging. Once I can find an MBA program I will feel much more settled; as it is, I’m constantly searching as the time goes by. Le sigh. I had to go to Target at lunch today to see the new Zac Posen collection. The quality impressed me and I’m somewhat of a fabric snob. I also pull the seams of clothes to see if they will pull apart. These didn’t! I bought a brocade skirt, size 1, so the sizes are true to size as I’m usually a 00 or 0. Very well made, and fabric is substantial and will hold its shape. I also bought a tomato plant for my little hanging tomato growing apparatus which I had purchased at Home Depot last week. So tonight I will plant it. I thought this little system would be good for me since it is my first try with tomatoes and I tend to kill plants. Some Miracle Grow Moisture Control soil and I think I will have taken every precaution I can take to secure its life! My other seedlings are not growing yet, but since I planted them a week ago they should start soon. This weekend I read a book, Big Girl by Danielle Steele. Yes, I finished it. I’m that way when it comes to books, once I start it, I can’t put it down. It was very thought provoking as the character deals with her eating disorder of sorts as a result of the just horrid level of emotional cruelty inflicted upon her by her parents. Whether or not one chooses to overeat for comfort, or not eat for comfort, is rather intriguing to me. I sat in my garden on Sunday afternoon and read; it was delightful. With Peets decaf, what could be better? I haven't taken an afternoon just to read for quite sometime and I felt so refreshed afterwards. And inspired to go upstairs and continue painting. My little reading cafe is complete (that's what I've named it). Now for the hallway walls. I mixed 3 1/2 gallons of paint that I had to make the color; recycle, resuse, renew, I beleive I am touching upon each of those here! Speaking of the garden, Everything is in bloom. The apricot tree is so full that the gardener recommended that I stake it so that it doesn’t fall over. Apricots and 0% Fage yogurt will be wonderful breakfasts and lunches throughout spring,. And I have to report that a darling hummingbird has built a tiny, little nest in the plum tree, which right outside of the garden room. I often have my computer on the table and watch her. I didn’t realize she had a nest until today. This was an ordeal! I had to change from an old business URL to a new one. I'll contact each of my followers directly with the new URL, because I think the old connections have been lost, sadly. Happy Earth Day, dear Friends! Happy Earth Day! Happy day for me as someone who is passionate about recycling, living green and trying my best to be organerexic! My new favorite motto is Proud to be Organerexic! If you would like to volunteer to help the earth or a cause in your area, look at this site, All For Good, and you can volunteer in your area. I've committed to a day in May. A cheery Hello! I hope everyone survived tax season with money coming in for all of the delicious Spring fashions! I'm blog cleaning and wanted to update you on the changes. First, I have merged my Home Design blog into this blog, Red Lipstick. The posts will just appear in date order. The address for Red Lipstick will be http://www.redlipstickstyle.com/ and this should go into effect by Wednesday, April 21. Please update your searches so that you can find me! 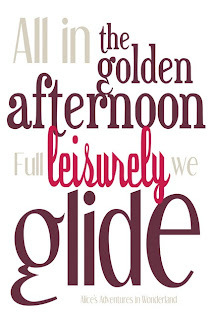 Looking forward to cleaning up some other issues and getting back to blogging! Quality is key for me, and I did not buy anything from the last couple of collections because I couldn't get past some of the issues that I had with the fabrics. I've been awaiting this line, however, ever since I had heard about it. I like the top on the left and the skirt on the right. Although short, I think that being petite I could style it so that it would be spring time fresh, and not sleazy. The skirt on the right is sooo cute, and would work with my current facination with ballet flats while my severely sprained foot. I'm DYING to wear heels, sandles, however my sad, still purple foot is not having any type of heel! I also adore the suit in the middle. If you are near Manhattan, a pop-up store on Eighth Ave, at 34th St will debut the line on April 15, with a 24 hour shopping event! Perhaps to take our minds off tax day?! How adorable is Dakota Fanning, who is wearing a stylish Zac Posen tuxedo blazer for $50?! I would wear this outfit, I love the blue top, which adds some spring color to my beloved black looks. I want this rain coat! Adorable. Zac on the runway. Tailored with edge, which is why I think there is so much excitement about his line. What do you think? Are you going to have a look at this line? HaPpY Easter to all of my dear friends! He is Risen and because of that we each have hope, peace and Life more Abundantly! May all the blessing of Easter be yours. Thankfully not! However, I however, I do love Wisteria! 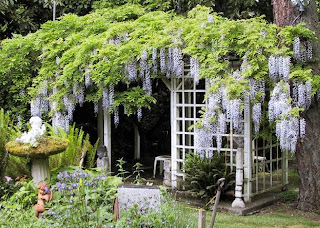 I have always wanted a Wisteria vine. Tonight I found one at the Asian market! Its fabulous, and while tiny now, will grow quickly. I want this... 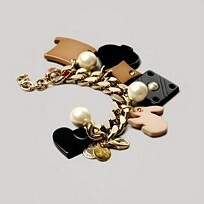 I can't recall where this picture is from...do you know the designer? 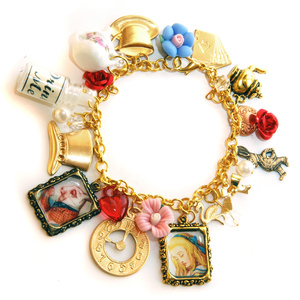 Take a trip to Wonderland each time you put on this fun, fantasy charm bracelet. antiqued goldtone finish. 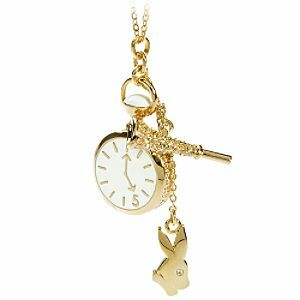 Alice in Wonderland-inspired charms, including a cat, a flower, playing cards, a spoon and teacup, a kettle, a top hat, a mouse, Alice, a crown, a white rabbit, a clock, a flamingo, and colored crystals. From Kirks Folly. 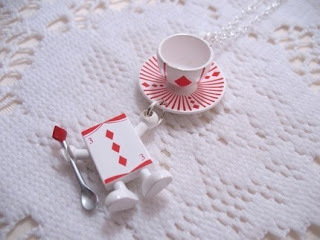 Themed after Alice in Wonderland, a Red and White Diamond Playing Card holding a matching Spoon, hangs off of a matching Tea cup and Saucer.